Our KidsYoga classes are a great way for children to end their school day. This unit will focus on finding our “IN", helping children learn techniques to comfort and calm themselves in this busy world. 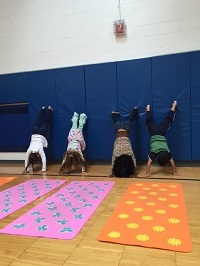 Taught in a child friendly manner exposing the students to basic yoga poses or asanas, fun flow sequences, breathing techniques and mindfulness. Children learn to clear their minds while strengthening and stretching their bodies. All classes end with a meditation exercise called Savasana, which is always a class favorite. Qualified students will earn a bandana at the end of the unit. Class may be partially paid with BC/BS Health Insurance or Independent Health Flex Fit cards. Please call 716.445.1009 to see if you qualify for a discount. Please read: Please send a note to your child's teacher letting him know your child is staying after school.